Electric cars have burst in to the car industry within the past decade now representing over a 5% market share in Britain. Huge strides have been made in technological advancement in this time, which is making electric cars more and more affordable however, are they really the future? The government has created a target that by 2040 all new vehicles must be electric (this does include hybrids) although many commentators want to see this target brought forward 10 years. This is part of their ‘Road to Zero’ scheme. On of the things the government are doing to try increase the appeal to electric cars is offering a grant of up to £3,500 on its list price. Some car makers in Britain have stepped up their investment for electric cars. Jaguar Land Rover in January announced investment into a battery site at Hams Hall that will produce hybrid and pure-electric systems for its cars, while Aston Martin has stated an ambition to produce the batteries for its luxury Lagonda vehicles in the UK. However, there is evidence that Britain is falling behind the rest of the world when it comes to electrification. Britain builds the Nissan Leaf — the best-selling electric car in Europe — with imported battery cells from Japan packed together into larger packs at a Sunderland site and used in the neighbouring car assembly plant and BMW has stated that while it will still assemble the electric version of its mini at its Oxford plant, the batteries will be shipped from Germany. The issues surrounding electric cars do not stop there unfortunately. 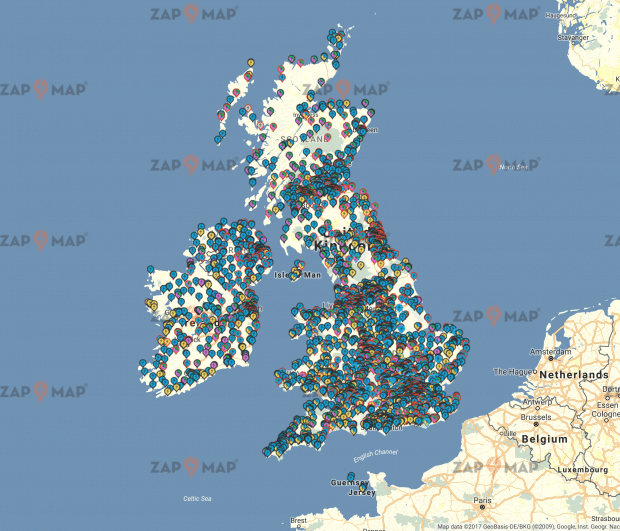 Currently there is only a “patchy” network of charging points which is discouraging UK drivers from embracing electric cars, analysis suggests. More than a third of local authorities have ten or fewer locations where drivers can plug in their vehicles with wide variation across the country. The average distance between points varies from 10km in Craven, North Yorkshire to just 0.16km in Westminster. The Department for Transport says 80% of charging is done at home, but for drivers who do not have access to off-street parking, access to charging points is essential. New research found that more than four-fifths (84 per cent) of the public wouldn’t consider buying an electric vehicle unless the Government invests heavily in a comprehensive public charging network. There is also evidence that range limitations and the upfront costs are also putting drivers ff electric cars. A survey by WhoCanFixMyCar.com found that two fifths (40 per cent) haven’t purchased an electric vehicle due its range limitations In addition to this 48 per cent of drivers surveyed haven’t purchased an electric vehicle due to the cost, which tends to be typically higher than petrol or diesel. The average price of a non-electric car is £12,919 whereas the average price of an electric car is nearly £20,000. Insurance tends to be higher for electric car owners. Matt Oliver, car insurance expert at GoCompare, said: “Insurance for AFVs tends to be slightly more expensive than for petrol or diesel counterparts, due in part to the higher cost of new AFVs than equivalent traditionally fuelled cars and the costs of repairs and parts, which aren’t as widely available.” However, he continued on to say that this would likely change over the next few years as demand for these cars increase. While insurance costs on paper my cost typically more, electric cars can benefit from zero tax if it costs under £40,000. Mr Oliver did, however, say that this is likely to change over the next few years as demand increases for these cars. It would seem then, that whilst it’s unlikely to see a revolution of electric cars in the next few years as costs are still too high and the infrastructure still isn’t in place. However, as we move into the medium to long term and these issues are addressed it is almost guaranteed that electric cars, or at least hybrids, are set to take over the car industry.